I'd like to share with you my favorite panfish rig. It catches them year round. It catches bluegill, it catches green sunfish, and it catches crappie. It is, in my opinion, the greatest panfish rig ever. Let me first start out by saying that just because it is one of the best rigs, that doesn't mean it works like magic. I would not, for example, recommend using the rig for panfish when they're deep. Besides that, it's deadly most of the time. This is a method my dad likes to call "slip-jigging." It's a variation of the float-n-fly. 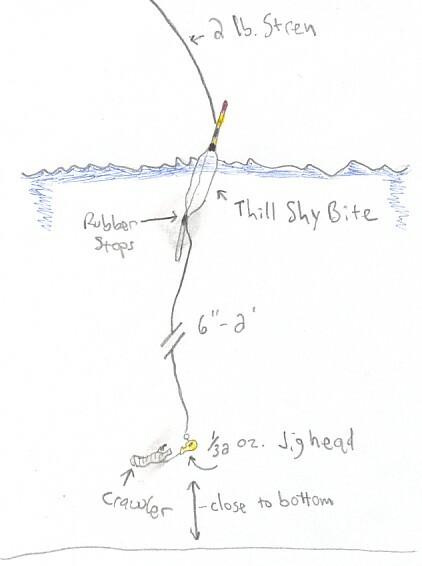 The rig consists of a Thill "Shy Bite" float, rated for 1/32 oz. sensitivity and a florescent 1/32 oz. jig head tipped with a small portion of night crawler. I like to use the Bass Pro Shops painted jig heads in florescent chartreuse, but your local tackle store should have a good selection of some quality jig heads. For a line choice, I use Stren 2 lb. line on a super-ultralight spinning combo. It's a light rig, so light gear is a necessity. Here's where things get specific. Notice I said a "float" and not a "bobber." Forget bobbers altogether. 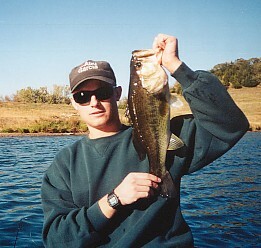 Using a pencil float instead of a bobber will be more effective for two reasons. One, it will provide less resistance once a fish pulls it under. Second, if the float is not perfectly upright, this will tell you it is either on the bottom or in a fish's mouth. I emphasize one word when using slip float rigs-balance. Use the proper amount of weight for the right sized float and you will have a balanced, sensitive rig. "Slip-jigging" is the act of casting your balanced rig into about 6"-4' of water and letting it sit there. Here's another crucial point: Don't let your rig sit longer than 1 minute. Impatience is good. If a fish doesn't hit within the first 30 seconds to 1 minute, they're not going to hit at all. Cast to a different spot. If you make only 1 cast per 10 minutes, the effectiveness of the rig will be drastically reduced. Once the float disappears under the water, strike right away. It's good to have some hemostats on hand, because the bluegill often take the jig too deep. The place to use this rig is on smaller bodies of water, where panfish are numerous and their nests are easily found. They can be used on big reservoirs too, but bluegills tend to use the deeper water here. Use the slip-jigging method in the right time and right place and it can truly be the greatest panfish rig ever. Does their need to be a barrel swivel somewhere in the rig? I really like this particular rig because like you said it DOES work all year round!!! Great work!!! I love how the opening pose reads as one big shape when your eye gnelcas over it...on further inspection, it reads as an emotion! (pensive, slightly impatient, etc.) Perhaps it sounds simple, but that's an incredible accomplishment. Also love the opening up of negative spaces in the next pose, the instant readability...these really are fantastic. Thanks for sharing!